I'm changing my observing method again. Full disk imaging using my Droid Razr HD and S4 Gear smartphone mount . Can you describe more about your setup to take that image? Maybe a pic of the rig and description of the software to prepare that image. I'm fascinated that a smartphone could be put to work like this. This question may already been answered somewhere, but could someone give me a quick answer - How are the sunspot counts "normalized" between observers? For example, an observer with large aperture and excellent seeing is going to detect more sunspots than one with small telescope and poor conditions. How is this discrepancy in counts handled? There may not be a simple answer. At this time we are investigating ways to accept group and sunspot counts into the SunEntry database from folks who want to use cameras. As some images are taken with a video camera, other's with short exposure rates from a CCD, there is yet no method for normalizing these. 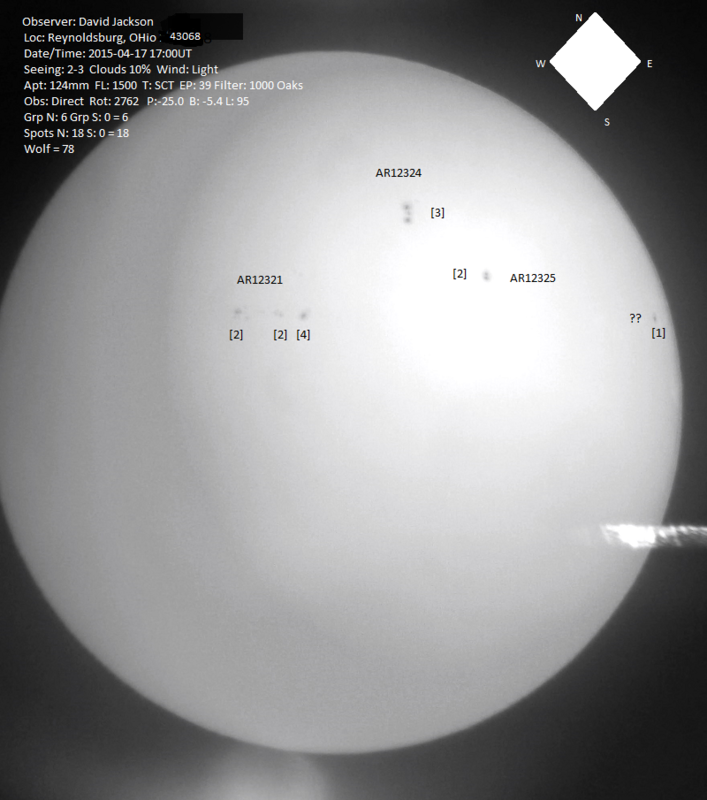 We are accepting computerized mehods for counting groups and sunspots from Jan Alvestad, who processes the SDO (Solar Dynamics Observatory) satellite magnetograms and white light images. We are still investigating how these data comapre to our visual observers counts. As an example for how we might calibrate CCD or camera images please read the attached analysis by Jamie Riggs. Oh Good grief! Thanks David..... but no thanks. I think I will avoid sunspot counting, equally along with UGZ classification, as being just too much of a "pain" to sort out. I'll stick to simple visual estimation of stars to 0.05 magnitude. Thank you. I am mainly using it for the positioning of the sunspots. Sunspot counts are still done at the eyepiece. Here's a couple pictures of my setup.